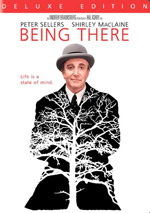 Being There is based on Jerzy Kosinski's short comic novel about a simpleton, Chance (Peter Sellers), raised in isolation whose only education came from watching TV. When he's forced out of the house where he worked as a gardener by the death of the wealthy recluse who raised him from infancy, he's fortuitously struck by a limousine carrying Eve Rand (Shirley MacLaine), the wife of a wealthy industrialist. He's mistaken, because of his well-tailored suits, for a man of means and taken to dinner with her husband, Ben Rand (Melvyn Douglas). There, as Chauncy Gardner, his blank affect is taken for seriousness and his literal pronouncements about gardening for metaphoric economic predictions. Soon he's meeting the president (Jack Warden) and becoming a star on TV - where he's a natural. For his penultimate film role, we find Peter Sellers in 1979’s Being There. Here the chameleon-like actor plays Chance, a man who has lived his whole life in the same Washington DC home. Cognitively and emotionally limited, he experiences life via TV and knows nothing else of the outside world. A major change occurs when Chance’s guardian dies. This leaves him homeless, and he wanders the streets of DC. As this occurs, he gets injured in a minor traffic accident when the car owned by wealthy Eve Rand (Shirley MacLaine) hits him. She takes him home to care for his leg, though she mishears his name as “Chauncey Gardiner”. While he stays at the Rand residency, Chance gets to know his benefactor and her powerful but sickly businessman husband Ben (Melvyn Douglas). He says little more than phrases he absorbed from TV, but those with whom he connects tend to interpret these as homespun wisdom. In an odd twist, Chance becomes an influential figure in business and politics, and his encounters lead him all the way to the president (Jack Warden). Many have compared Being There to Forrest Gump, and those two do offer an awful lot of similarities. However, I kept thinking that There reminded me more of Big. I certainly see the ways in which There and Gump mirror each other, but something about it gave off that Big vibe in a big way. In contrast with both Big and Gump, however, There tends to really understate its content. Don’t take that as a swipe at the others, especially not Big, which I think is a marvelous film. However, There provides a considerably less sentimental affair. It features little score and doesn’t attempt to manipulate our feelings as it goes. It presents its material in a rather matter of fact way that gives it a good spin. That also allows the movie to cross genre boundaries. It spans drama and comedy in a variety of ways, but director Hal Ashby depicts events in a low-key manner that doesn’t push the viewer one way or another. I like that side of things, as it means the film avoids one-dimensional traps. In terms of lead characters, Being There and Gump have the most in common, as both feature generally emotionless dullards. That’s one area in which Big clearly has the edge, as Tom Hanks took on the most challenging role there. He was a man who had to play a boy in a man’s body, whereas his Gump and Sellers’ Chance are simply unintelligent men. Sellers earned a lot of praise for his performance, and I think he does just fine in the part. However, I don’t believe Chance is a terribly demanding role. Sellers essentially needed to find one note and play it for the whole movie. The character doesn’t grow in any notable way, and he’s not required to display much range. I can’t fault Sellers for that, of course, since he simply played the part as meant to be. Being There doesn’t seem like the sort of movie to bowl over a viewer. It’s so relentlessly low-key that it threatens to make no impact, but it tends to stick with the audience. It features understated and interesting social commentary. Being There appears in an aspect ratio of approximately 1.85:1 on this single-sided, double-layered DVD; the image has been enhanced for 16X9 televisions. Many flicks from the late 1970s tend to look pretty flat nowadays, but Being There provided surprisingly dynamic visuals. Sharpness looked quite good. Only minor softness ever cropped up, as the movie usually appeared concise and well-defined. I noticed no signs of jagged edges or moiré effects, and I detected only light edge enhancement. Source flaws were very infrequent; I saw a couple of specks but that was it. Colors worked well. The film boasted a natural palette that came across with warm, clear hues. Blacks were tight and deep, and shadows demonstrated good clarity and delineation. This was a terrific transfer that just barely fell below “A” level. As for the monaural soundtrack of Being There, it was perfectly acceptable for its era but no better than that. Speech sounded intelligible and clear, though the lines tended to appear a little metallic. Effects and music played small roles. The movie offered very little score, so only a few musical elements appeared. They lacked much range but remained decent. Effects also failed to display much to impress, though they didn’t have a lot to do in the movie. This wasn’t exactly an action extravaganza, so these elements focused on general atmosphere most of the time. The effects represented the source elements in a basic manner. All of this was good enough for an age-adjusted “B-“. In addition to the movie’s trailer, we get a featurette called Memories from Being There. This 14-minute and 47-second piece provides notes from actor Melvyn Douglas’s granddaughter Ileana. She discusses her grandfather and aspects of the movie. Douglas offers a decent little chat at best, as the program doesn’t dig into the movie with much depth. If you look for broad comedy and social commentary, stay away from Being There. The film provides a fairly clever and insightful project that delivers the goods in an understated manner. The DVD comes with surprisingly positive picture and decent audio, but it lacks substantial extras. The latter factor disappoints – “Deluxe Editions” shouldn’t be so supplement-free – but this remains a nice release for an involving flick.